New details of the upcoming All-Stars Racing sequel, Transformed, have raced over to IGN, and these should be very pleasing to older SEGA fans! Speaking exclusively to IGN, SEGA have revealed a bunch of new information regarding Sonic & All-Stars Racing Transformed along with a completely new trailer, teasing new characters to the series, including Vyse from Skies of Arcadia, Gilius Thunderhead from Golden Axe and... Joe Musashi from Shinobi! Joe Musashi is a welcome, if somewhat unexpected addition to the cast, and will be using a quad bike to get around. 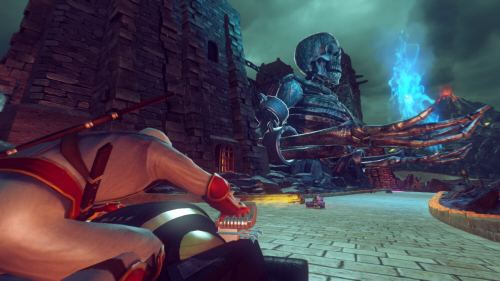 SEGA have also revealed a new Jet Set Radio track and a level based on the Golden Axe games, Adder's Lair, which should look pretty familiar to fans of the series. Sumo Digital seem keen to introduce dynamic elements to these tracks as well, with new routes opening up throughout the race, or, in the case of the new Jet Set Radio track, battles between the Rudies and police taking place in the background which escalate as time passes. It definitely sounds like Sumo Digital are keen to dip into the history of SEGA IP's this time round, which should please most SEGA fans. Today's announcement is probably that major news tidbit that we posted about yesterday, as we're now well into the pre-E3 festivities. You can read more over at the IGN website, and do check out the new trailer below. Are you excited for Joe Musashi? What other SEGA characters and tracks would you like to see? Drop us a comment below or get involved in the discussion on our message board. Joe. Freaking. Musashi. That is all.